Montezuma's Revenge. After The Ball. Searching For Gold. White Rock. The Battle - The Forest. The Lost Cycle. The Prisoner. Part V: The Reaper. Featuring John Anderson, Steve Howe, Chris Squire, Bill Bruford And Rick Wakeman ! 2009 Digital Remaster. Factory-Sealed, Straight From Japan ! Title : Close To The Edge 4. I. Cord Of Life. Label : WARNER MUSIC JAPAN. CDs in mint/near mint condition in cardboard slipcases with box sleeve. Sleeve may have stickers and will be worn consistent with age (see scans). Part II: The Maker (Edit) 2. Part II: The Maker (Edit). Hier folgende 2 CD / Here following 2 CD Part I: The Warning (Full-length Version) 1. Part I: The Warning (Full-length Version). Part III: The Spaceman 3. Rick Wakeman - Rick Wakeman's Criminal Record. Title:Rick Wakeman - Rick Wakeman's Criminal Record. Artist:Rick Wakeman. Your item will be previously owned but still in great condition. The disc will play perfectly without interruption and the case, inlay notes and sleeve may show limited signs of wear. Artist:Rick Wakeman. All of our paper waste is recycled within the UK and turned into corrugated cardboard. Your item will be previously owned but still in great condition. The disc will play perfectly without interruption and the case, inlay notes and sleeve may show limited signs of wear. M or Mint: A CD in perfect condition. The jewel case is pristine. The liner notes, inclusions, and/or sleeve are in like new condition. Note about jewel cases Without jewel cases - 1. All CD’s are at least Ex or Mint unless noted. CD NUMBER: D20Y 4010. CONDITION: JACKET: VG / OBI: NM / DISC: VG. Japan JEWEL CASE CD. Jewel Cases & Trays & Plastic Sleeves are often replaced if any dirt, mold, cracks, stains, scuffs, etc. Polish doesn't count for conditions, our view of disc is for listening & playing. 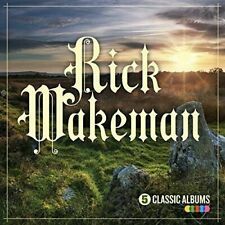 Artist: WAKEMAN,RICK. Title: 5 CLASSIC ALBUMS (UK). Format: CD. Condition: New. Die Soundqualität ist superb und The English Rock Ensemble und Rick sind in sehr guter Form. Hier folgende CD / Here following CD 3 Lencelot & The Black Knight 00:05:27. 5 The forrest 00:06:43. ALL CD’S, TAPES AND VINYL ARE UK ORIGINALS UNLESS OTHERWISE STATED. CD’S & 7” SINGLES. REST OF THE WORLD - £5.00. UK - £1.40. EX – EXCELLENT. The fire ("The burning") 7. The fire ("The burning"). Campfire story ("The burning") 6. Campfire story ("The burning"). Doin' it ("The burning") 8. Doin' it ("The burning"). Devil's Creek breakdown ("The burning") 9. Rick Wakeman And The English Rock Ensemble ‎– No Earthly Connection RARE CD! Matrix / Runout: UICY-9295. 1 Part I: The Warning. 2 Part II: The Maker. 3 Part III: The Spaceman. 4 Part IV: The Realisation. 5 Part V: The Reaper 7:34. CD in mint/near mint condition in jewelcase. Jewelcase may have stickers (see scans) and may be worn/marked consistent with age and storage. Release date : 2018/08/24. Warranty period is complied with manufacuture regulation. Back to top. Unless noted otherwise, General notes for Japanese products are followings AC95-100V / 50-60hz, Plug Type A. Artist:Rick Wakeman. All of our paper waste is recycled within the UK and turned into corrugated cardboard. Can't find what you're looking for?. Your item will be previously owned but still in great condition. RICK WAKEMAN Retro CD (2006). on the President Records label; CF040807. CD, Inserts & Jewel Case in Excellent Condition! Title: MYTHS AND LEGENDS. Format: CD. Condition: New. Studio: A&M. Catalogue No : WMCD 2007. Wakeman & Cousins - Hummingbird. CD Album - Like new condition. RICK WAKEMAN. My Inspiration. 2 CD set released in Germany on the BMS label from the year 2001. Cover is also excellent with new jewel case. Kangaroo Flat, Bendigo 3555. Hier folgende CD / Here following CD Out There a. The Hidden Symphony g. The Beginning Of A Dream. Progressive Rock. Rock englischsprachig. The Cathedral Of The Sky. Music Of Love. Hier folgende CD / Here following CD Progressive Rock. Rock englischsprachig. JAPANESE 2003 MINI VYNYL REPLICA OF THE CLASSIC AND PROBABLY BEST RICK WAKEMAN'S 1975 ALBUM. WITH INLAYS AND OBI. A&M UICY-9263. BUENO (G): Son discos que todavía se pueden escuchar El disco se ve muy usado y viejo. Tiene ondulaciones. La portada puede tener cinta adhesiva, puede haber agujeros o rasgaduras. Los colores ya perdieron fuerza. 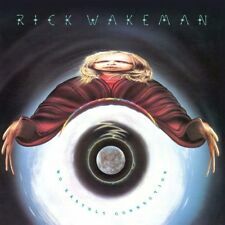 RICK & HIS BAND WAKEMAN - CIRQUE SURREAL CD NEU. "Rock" (Rock / Rockpop). Hier folgende CD / Here following CD The Party Fraser Thorneycroft-Smith (Guitar) 4:05. Balance Of Power Fraser Thorneycroft-Smith (Guitar) 5:32. 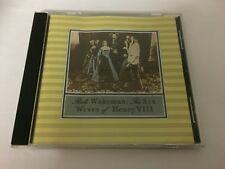 RICK WAKEMAN - THE SIX WIFES OF HENRY VIII - cd- LIMITED EDITION,RUSSIAN VERSION, EXCLUSIVE cover, NO LABEL. 1 Catherine Of Aragon 3:41. 2 Anne Of Cleves 7:50. Hier folgende CD / Here following CD Erscheinungsdatum / Release date: 25.11.2016. Elizabethan Rock. Open Up Your Eyes. RICK WAKEMAN - TIME MACHINE CD NEW! "Rock" (Rock / Rockpop). Hier folgende CD / Here following CD The Battle. The Forest. M or Mint: A CD in perfect condition. The jewel case is pristine. The liner notes, inclusions, and/or sleeve are in like new condition. MADE IN ENGLAND. Note about jewel cases Without jewel cases - 1. Hier folgende CD / Here following CD G'olé ("G'olé!"). Frustration ("G'olé!"). Black pearls ("G'olé!"). Shadows ("G'olé!"). No possible ("G'olé!"). Red island ("G'olé!"). Wayward spirit ("G'olé!"). Richard Christopher "Rick" Wakeman (geboren am 18. Mai 1949) ist ein englischer Keyboarder, Songwriter, TV- und Radio-Moderator, Autor und Schauspieler. Er ist bekannt seit seiner Zeit in der Progressive Rock-Band Yes zwischen 1971 und 2004 und für seine Solo-Alben in der 1970er Jahren.